More than 300 volunteers pitched in to mulch, weed, beautify, and clean up the Richmond Greenway Monday as part of the Martin Luther King National Day of Service in what was the Greenway’s biggest volunteer effort yet. Formerly a railway that sat unused for more than 25 years before being converted into green space, the Richmond Greenway is a walking and biking path lined with fresh produce plots available to all, native plants, and a naturally landscaped creek created to help absorb rainwater and filter pollution. Kenisha Jackson (center) and Kare Hughes (right), both 17, discover that mulch and gossip are not mutually exclusive. The two friends are volunteering with the Making Waves educational program, which helps with college preparedness. They have been participating in the program since the fifth grade. William Haynes, 17, performed an edgy stand-up comedy routine about race relations as part of the Greenway’s entertainment program. Haynes, who is part of the RYSE Center, has become well known outside of Richmond for his wry humor and YouTube channel. Youth were a large portion of volunteers Monday, helping make this year’s cleanup the biggest of the four on record. Nahid Ebrahimi (left) and Tania Palido (right), from Urban Tilth, work the soil in Berryland. Palido, the year-round caretaker, explains that they have just added coffee grounds to the patch to enrich the soil quality. Strawberries and raspberries are just the beginning in Berryland, she says. There are 18 varieties of berry growing there, including goji berry, huckleberry, and elderberry. Kathleen Wimer, a volunteer with the Citizens for a Sustainable Point Molate and the Richmond Progressive Alliance, pulls weeds and spreads mulch. Elementary school students in the Richmond College Prep choir croon and clap during their performance. Charity Battiste (front), Eliana Gonzalez (middle), and Maricela Navarro (back) weave strips of fabric through a chain link fence in a beautification project led by the Friends of the Richmond Greenway. The goal is to remind residents that the Greenway is public space and theirs to design. Students from Richmond College Prep perform Spanish dancing in neat pairs. Andy LaBar, educational coordinator for the Watershed Project, demonstrates how water flows through an urban ecosystem. 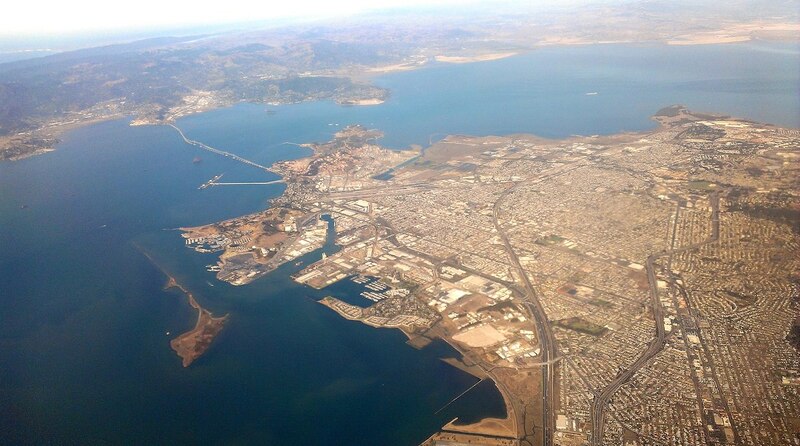 In cities like Richmond where much of the surface is paved, rainwater runoff caries pollution directly into the Bay. The Watershed Project uses natural landscaping on the Greenway and beyond to help manage pollution by improving the absorption of runoff. Jason Del Arroz, of Climate Corps Bay Area, trims plants. Jorden Mbaeri, 15, carts wheelbarrow after wheelbarrow full of mulch around the Greenway. “My mom made me come out,” he explains. The steam coming off the mulch piles, the result of decomposition, mixes with a thick morning fog that soon burns off. Kenady Jackson (front) 12, and Hiwot Dejere (back), 11, serve up colorful bowls of soup cooked by a local chapter of the Alpha Kappa Alpha sorority. They are part of a group of younger sorority members, or “promising pearls.” The vegetables that contributed to the soup were locally harvested, mostly from the Greenway. Stylish street clothes didn’t prevent kids from digging in and getting a little dirty. Jasmine “Jazz” Hudson of the RYSE Center performs spoken word that awakens the crowd.